In its original Marino yellow with a re-trimmed white and yellow interior. 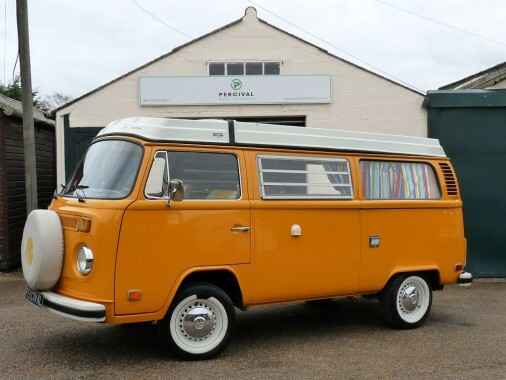 The camper arrived from the U.S. in 2013 and was then restored by a VW specialist. The bodywork was fully stripped, any necessary repairs carried out, and then fully repainted in yellow with Pastel white to match. New rubbers went in, including for the new pop top, new interior trim and floor covering, lights including H4 Halogen headlights and a new headlining. An immaculate original sink and cooker unit was fitted along with 240V elctrical hook up and a JVC stereo. As part of the original specification, the front seat swivels round. Seat belts are fitted front and rear. A brand new, rebuilt 2.0 litre engine with a Guarantee was fitted as was a fully rebuilt gearbox and steering box and the suspension and brakes were overhauled as required. There is an invoice for the rebuild documenting the work, and bills showing constant maintenance and servicing in the 3,000 miles since the VW went back on the road.